Khichdi is one of the recipe which is very light in weight and easy to make and very delicious dish. Khichdi is a India's comfort food. This dish is made up with rice, moong dal and very less spices. In our home, we can eat once or twice in 15 days. Because we eat spices or oily food in our daily routine. So, eating Khichdi is good option for balancing our health. This is very common dish across India, but using with differ-2 names. This is my and my sister favourite dish. This is best combination with curd/ yoghurt, roti and Ajwain Paratha. 1. Clean the rice and moong dal and soak it in water. 2. Heat 2 tbsp. of Desi ghee in a pressure cooker and add jeera and wait for to splutter. 3. 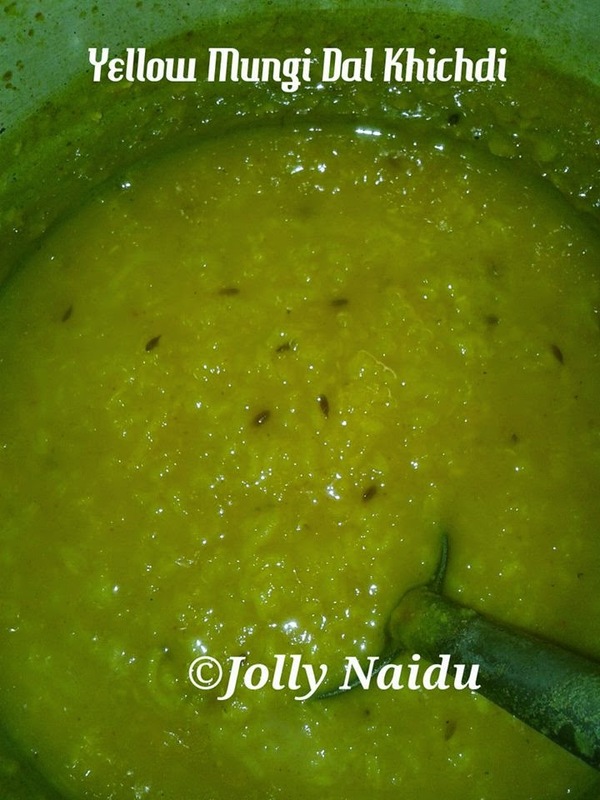 Drain of the Rice-Moong dal and add it to mixture in the cooker. 4. Add enough water so that there is layer of water floating on top of the rice-dal mixture. 5. Add masala's like Salt to taste, Turmeric powder, Red chilli powder. Mix well and then close the cooker with it's lid. 6. Pressure cook 2-3 whistles , and remove off the flame. Sprinkle Garam Masala Powder and Mix well. 7. Serve hot Khichdi with curd, pickle, chapatti and Ajwain Paratha. Special Tip : If you feel, Khichdi become thick, not to worry add water and boil it so that water is cooked in Khichdi.